Surprisingly often, they’re copied from mayo jars and famous cookbooks. When Danny Meyer was gearing up to open his barbecue restaurant, Blue Smoke, there was one recipe he knew he had to have on the menu: his grandmother’s secret potato salad recipe. “I told the chef, ‘My very favorite potato salad in the world was the one my grandmother made,’” Meyer recalls. That’s a big statement coming from Meyer, a successful restaurateur who has earned Michelin Stars and founded the fast-casual chain Shake Shack. At the time, his grandmother had already passed away, but Meyer remembered that she kept recipes on three by five index cards. After a search, he found the right card and handed it to the restaurant’s chef, who invited Meyer to try it in the Blue Smoke kitchen. When Meyer arrived, the sous chefs had a big bowl of potato salad that brought back memories of his grandmother. He tried it, smiled, and told the chefs, “That’s exactly right.” They grinned back at him mischievously. Eventually, Meyer broke and asked, “What’s so funny?” A chef pulled out a jar of Hellman’s mayonnaise and placed it on the table. Meyer looked at it, then realized that the secret recipe his grandmother had hoarded for years was on the jar. It was the official Hellman’s recipe for potato salad. This actually seems to be a common phenomenon. The television show Friends even features a similar discovery, when one character, Phoebe, realizes that her grandmother’s “famous” chocolate chip cookie recipe came from a bag of Nestle Toll House chocolate chips. Two months ago, we asked Gastro Obscura readers to send in accounts of their own discoveries. 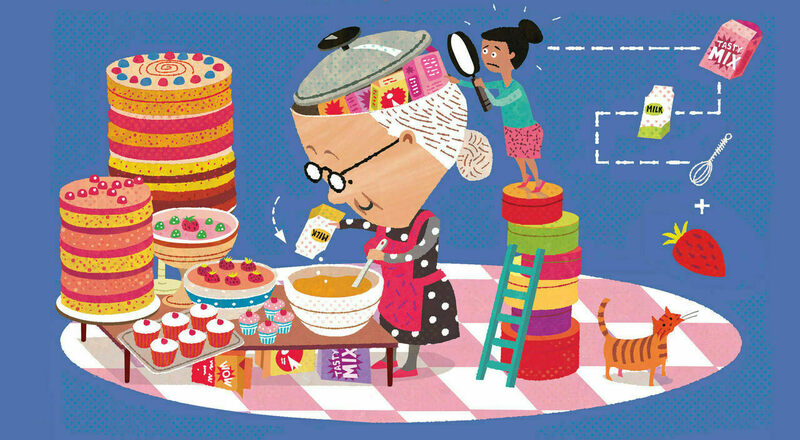 We promised a (loving) investigation of grandparents lying about family recipes. But instead we got a delightful look at the power of imagination, the limitations of originality, and the halo effect of eating a dish or dessert made by family. In response to our call, 174 readers wrote in with stories of plagiarized family recipes. Hailing from New York to Nicaragua, from Auckland, New Zealand, to Baghpat, India, they prove that this is a global phenomenon. The majority of readers described devastating discoveries: They found supposedly secret recipes in the pages of famous cookbooks, and heard confessions from parents whose legendary dessert recipes came from the side of Karo Syrup bottles. Once I was the judge of a chocolate chip cookie recipe contest. We stipulated that all cookies had to be homemade, no mixes or frozen dough. The top three cookies were chosen, photographed, and presented in a local newspaper along with the recipes for them. Calls and letters poured in pointing out that the first place cookie was the Nestle Toll House recipe and the second place recipe was the Toll House recipe doubled. You may be noticing a trend: Most of the stories concerned sweets. While we heard about stolen stuffings and copied casseroles, the vast majority of revelations centered around cookies, cakes, and, in one case, purple jello. I grew up in California, and every Christmas Day for as long as I can remember, my grandmother and then my mother would make wassail in the slow cooker. It simply was not Christmas until the kitchen smelled like wassail, and the simple recipe (apple cider, pineapple juice, honey, sliced citrus, and spices) seemed to differ from any other wassail recipe. So the assumption was always that it had been created by someone far back in the family tree and handed down. Recently, in a fit of nostalgia, I asked my mom for the recipe, and she dug out a printed recipe card and … It was a mass-produced recipe card from Macy’s department store. It turns out the wassail we enjoyed so much was a “freebie” recipe given away in the Macy’s kitchenware department during one holiday season back in the ‘70s to help sell Crock-Pots! It was a bit of a let down to learn it wasn’t really some secret family recipe, but I have since introduced my in-laws to it, and they insist I make it every Christmas. I was on vacation in San Francisco, and we ended up eating at what could only be referred to as a Chinese spaghetti restaurant. It was inexpensive and very popular. I ordered my meal, and they served soup as a starter. I took one bite, and it was my father’s vegetable beef soup. I almost got up and checked the kitchen, because he had passed away three months before. Finally I called my mom, and she said that’s not your dad’s soup; it is Muriel Humphrey’s soup. Muriel was Hubert Humphrey’s wife, who was appointed to his Senate seat after he died. My dad was a lifelong Republican, but clearly he could reach across the fence when it came to an amazing vegetable beef soup recipe. As with any fake news, family legends about supposedly secret recipes seem to germinate because they feel true. And they’re enabled by the surprising uncertainty we often have about our own history. One reader recounted how he thought his family’s Christmas cookie recipe came—like his family—from Germany. He later learned the cookie was Swedish, and that he was actually Irish and English. A final explanation for this phenomenon is simply that true originality is rare. Multiple cookbook authors have stories of asking people to send in family recipes and receiving dozens of nearly identical versions. “A lot of that has to do with [recipes sharing] very common ingredients,” says Stephanie Pierson, who wrote in to describe her experience asking for brisket recipes. When it comes to secret family recipes, people just want to believe. It’s a powerful idea: A supposedly secret ingredient can turn a recipe from a lid of cottage cheese into a link to an ancestral homeland. A supposedly hallowed family recipe can turn Betty Crocker cake mix into the world’s best lemon cake. Plenty of readers expressed dismay about discovering that a treasured recipe had a common origin. (Variations on the phrase “I died a little” appeared in multiple accounts.) But more frequently, when readers learned the truth, they accepted it and loved the recipe more than ever. The cookies and cakes and potato salads were, after all, still associated with childhood memories and departed loved ones. Meyer’s barbecue restaurant opened in 2002, and he’s pretty sure they served his grandmother’s potato salad (which was also Hellman’s potato salad) for the first few months. It's a wondrous dessert popular in Hong Kong, and we're challenging our readers to make it at home. The collections of Gastro Obscura readers feature cannibalism, bugs, and Dracula. Do you have an offbeat cookbook in your collection? Gastro Obscura wants to see it.